WASHINGTON — The downfall of House Majority Leader Tom DeLay (R-Texas) may come from his crony ties to Republican lobbyist Jack Abramoff and Michael Scanlon, DeLay’s former chief of staff. Over a three-year period, they allegedly fleeced six Native American Indian tribes of $82 million by pretending to represent their casino interests. Two of DeLay’s top aides are under criminal indictment, and a Travis County judge is expected to rule soon on charges that DeLay’s TRMPAC (Texans for a Republican Majority Political Action Committee) violated Texas law in soliciting corporate contributions to pay for DeLay’s redistricting power grab two years ago. The stench surrounding DeLay is so pervasive that, when he spoke to a convention in his hometown, Sugar Land, Texas, April 16, he was met with a picket line and a full-page local newspaper ad demanding that he resign. “Put the Hammer in the slammer,” the crowd chanted. President Bush has stood squarely behind DeLay, calling him “an effective leader.” DeLay, for his part, has suggested that he is being persecuted on ethics questions by a vast left-wing conspiracy. Bernie Sprague, sub-chief of the Saginaw Chippewa Indian Tribe in Michigan, told the World that Abramoff and Scanlon swindled his tribe of at least $14 million over a three-year period, posing as “lobbyists” for the gaming industry. In testimony before the Senate Indian Affairs Committee last Sept. 29, Sprague charged that Abramoff and Scanlon secretly bankrolled a campaign that elected eight tribal members to the 12-member Saginaw Chippewa Tribal Council. McDonald said Ralph Reed, former head of the Christian Coalition, “did the hatchet job” in scamming the Indian tribes. Reed served as a top Bush-Cheney hack in the 2004 election and is now running for lieutenant governor in Georgia. Abramoff hired Reed for $4 million to build grassroots support in Texas for then-Attorney General John Cornyn’s drive to shut down the Tigua Indian tribe’s casino in El Paso, McDonald said. Wrapping his campaign in “born-again” Christian opposition to gambling, Reed did not reveal that the $4 million came from a rival Indian tribal casino that was seeking to eliminate competition. Hours after Cornyn closed the Tigua casino, Abramoff contacted the Tigua tribal chief from his private jet. “He told the chief that for $5 million he would get a special bill passed through Congress to allow the casino to reopen,” McDonald said. Both DeLay and Reed have built their base in the Christian right, with many of their faithful genuinely opposed to gambling, not to speak of criminal fraud. Now they are caught accepting money and corrupt favors from gambling interests all paid for by hard-pressed Native American Indians. 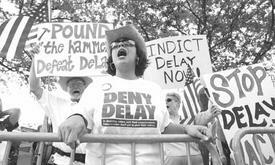 “This is another nail in Tom DeLay’s coffin,” McDonald said.